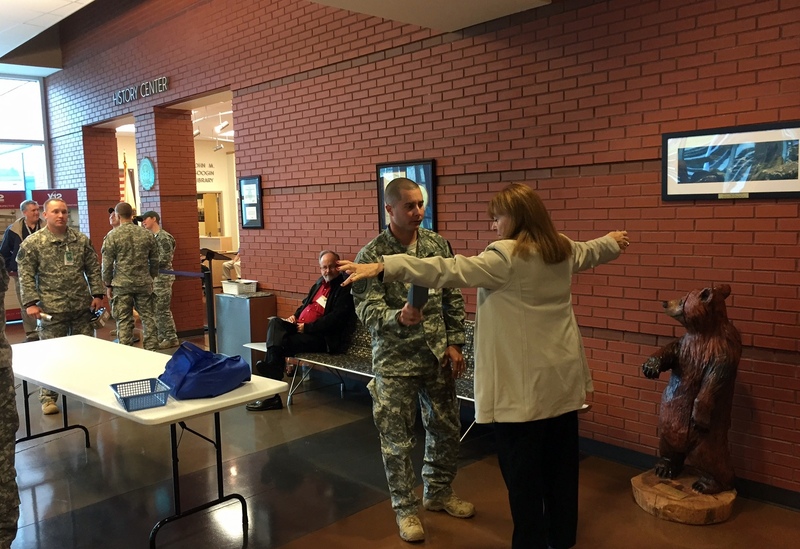 Oak Ridge businesswoman Bonnie Carroll undergoes security check Thursday morning before boarding bus for tour of historic facilities at the Y-12 National Security Complex and Oak Ridge National Laboratory. The tours were staged in conjunction with this week’s official establishment of the Manhattan Project National Historical Park. Smith, historian at the Oak Ridge plant that produced the enriched uranium for the “Little Boy” bomb dropped on Hiroshima, Japan, near the end of World War II, helped organize and carry out Thursday’s “special access” tours. The event was tied to this week’s official establishment of the Manhattan Project National Historical Park, and about 300 applied for the tours before online registration was shut down. As he maneuvered guests through the operating floor of Y-12’s Beta-3, Smith gave a walking lecture on the electromagnetic equipment — known as “calutrons” — that separated the isotopes of uranium and segregated the fissionable U-235 needed for bombs. It was a rare treat for history buffs and the nuclear curious. The only thing missing from the wartime remembrance was big band music playing in the background. Dr. Randy Reid, retired ophthalmologist and former chief of staff at Methodist Medical Center of Oak Ridge, and his wife, Karen, have lived in Oak Ridge since 1979, and Thursday was the first time they’d ever been inside Y-12. “It’s something I’d always wanted to do, always thought about doing,” Reid said. Karen Reid said it’s difficult to appreciate the sheer magnitude of the operations without seeing them firsthand. Beta-3, a key producer during the atomic bomb project, was important after the war, too. Its calutrons were used to separate stable, nonradioactive isotopes of materials for use in medicine, industry and research. The Y-12 facility, however, was off-limits to the public until 2005, when it was opened up for tours as part of the 60th anniversary of Oak Ridge and the bomb, and a few limited occasions since then. Another stop on Thursday’s tour was Building 9731, the oldest building at Y-12. It was the plant’s original pilot facility for testing of the calutrons — both the Alpha and Beta versions — and they were on display for Thursday’s visitors. Building 9731 has also been rarely seen by those without top-level security clearances. The first public access didn’t occur until 2010, when it was a featured attraction in Oak Ridge’s Secret City Festival. Hundreds stood in line to get a look-see. The Manhattan Project National Historical Park is still very much in its formative stages, and it’s not yet clear what historic facilities will be available for viewing and how often. That’s especially true at Y-12, which is still an operating production plant in the U.S. nuclear weapons complex. Beta-3 is located inside the high-security Protected Area, where the nation’s stockpile of bomb-grade uranium is stored, and Building 9731 is just outside it but under constant surveillance. “What we’re looking at is limited access on an irregular basis,” said Steven Wyatt, a federal spokesman at Y-12. The third stop on Thursday’s tours was the historic Graphite Reactor at Oak Ridge National Laboratory. The Oak Ridge reactor was the world’s first continuously operated nuclear reactor and during the early part of the Manhattan Project it served as a pilot facility for production of plutonium. It produced only a couple of grams of plutonium during the war years, and none of the Oak Ridge material was apparently used in atomic bombs. However, the reactor not only resolved some of the plutonium questions but it also served as a training ground for nuclear workers who then transferred to the production reactors at Hanford, Wash.
Public access to Graphite Reactor is available on a regular basis through Department of Energy-sponsored bus tours, but it, too, will be re-evaluated as the Manhattan Project National Historical Park takes shape over next few years at Oak Ridge and the park’s two other sites — Hanford, and Los Alamos, N.M.
Tracy Atkins, the project director for the National Park Service, said it typically takes three to five years for new parks to really get going. The first couple of years are focused on developing management and interpretive plans, she said. 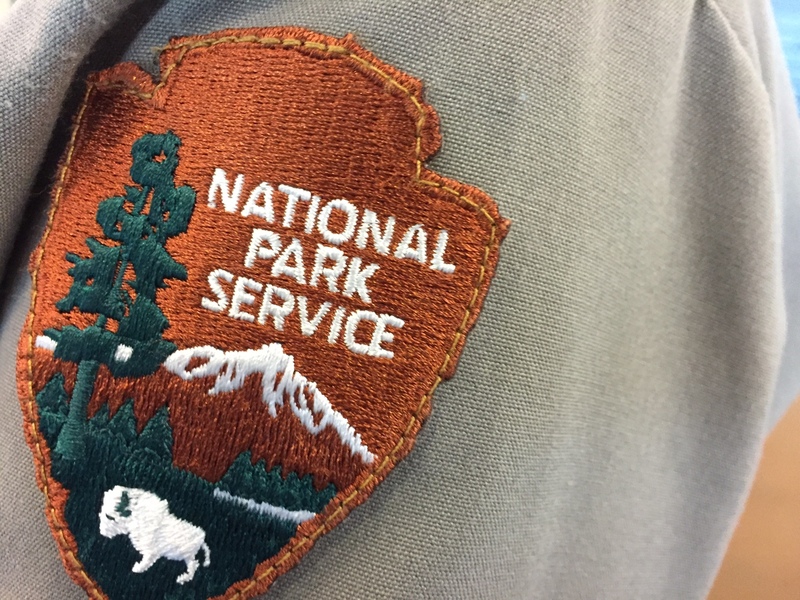 “We start off parks very thoughtfully,” she said, noting that the three-site Manhattan Project is different in multiple ways — including the partnership with the Department of Energy and ongoing national-security missions taking place at the park sites. “We will get things open as quickly as we can, but it’s going to take time,” Atkins said. This entry was posted in CNS, History, Manhattan Project Park, NNSA, nuclear, Oak Ridge things, ORNL, Y-12 on November 12, 2015 by Frank Munger.